Last month, during her official visit to Divisions 24 and 29, Governor Joni Ackerman presented awards to Kiwanis members who not only demonstrate positivity and change within their community, but she also presented a very special award to a young man who has demonstrated exceptional leadership, moral character, ethical conduct and outstanding academic accomplishment even in some of the most difficult circumstances. On behalf of the Atascadero Kiwanis Aktion Club, Governor Joni presented the Hope of America award to 13 year old Yussif Salam, who came to the United States from Ghana, Africa at the age of 4 with his father Awudu Salam. Yussif’s father, Awudu, moved from Ghana to the United States to become U.S. citizen. As his supervisor, Foundation Ambassador Brian Atwell says that Awudu was an outstanding mental health worker, who assisted community members in their darkest hour, and showed his ethics and moral character was a great example for his son Yussif. In 2014, Atwell sponsored Awudu in becoming a US citizen, and soon thereafter he and his son became U.S. citizens. One year after Awudu became a U.S citizen he was diagnosed with cancer and fought hard at Stanford to return to work and care for his son as a single dad. However, in February 2017, the cancer had returned and Awudu entered his final rest on April 25, 2017, leaving his 12 year old son – a new US citizen – with no other family in America. Before his passing, Awudu and Atwell met with Yussif’s Vice-Principal who informed Awudu an Atwell that she and her husband loved Yussif, and they would be honored to accept him as a member of their family. With that, Awudu signed guardianship over to Kevin and Jillian Cota. Since Awudu’s passing, Yussif has graduated the 6th grade, and is now a member of the Cota’s family. Today, Yussif is a happy 13 year old 7th grader who has many family and friends and maintains a remarkable and well-deserved 4.0 GPA. 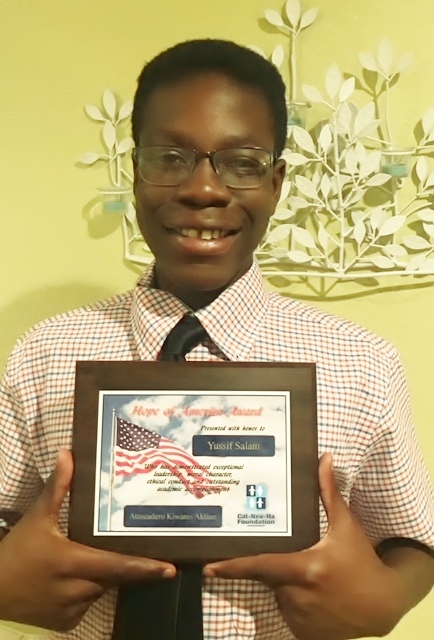 Yussif is the epitome of what the Hope of America award represents because he shows leadership, ethical and moral character, and academic competency each and everyday.